STEEL CITY DUST COLLECTOR Working great !!! Now mind you I have only had this machine for 1 month .and my shop is small, no planer to fill the bags ..but i love it so far …At 1.5 HP the power is terrific. The noise level rated in the book is 87db and actually it seems less when i run it …I did opt for the Shop Fox remote as it seems when ever I want to turn on my DC system I am on the other side of the room …so with 2 remotes …i attached to a stick and earth magnet on the back i can hang one from my bandsaw and another in my pocket and voila ..
All in all ….tho my review may be too soon to tell ….I love my STeel City Dust Collector .. Thanks for the review. I am in the market for a dust collection system. This review has been helpful. get the dust off that has collected on the inside surface bag. thanks for the review. I’ll be in the market for a dust collector when i start getting more big tools. this looks like a good one. thanks for the review. ps. I am going to get a remote control for it as it is at the far end of my shop too …..one other thing…if you ever do get a planer / jointer , do yourself a favor and get one of those seperator / metal trashcan devices…they empty a lot easier than having to remove that bottom bag !! looks great. 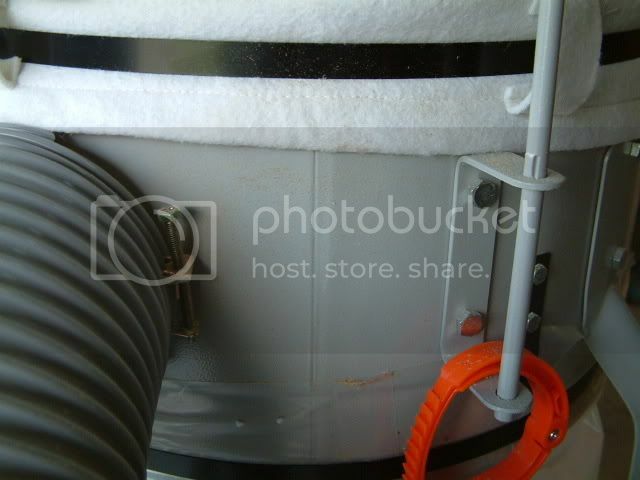 I’m in the market for my fist dust collector because I am absolutly sick of all the dust in my shop. I will put in a duct system and then run it to all my machines. I will have to make a cabinet for my tablesaw much like a cabinet saw. It will have a hood underneith and shelves behind a door to give me some storage. I am looking at the delta 50-760 because of the award it got in wood magazine and all the great things I have heard about it. Yours looks really nice as well. I recently bought my first big dust system as well. I know Harbor Freight is not at the top of the woodworking food chain, but a 2 hp, 2 bag vertical system (that looks like everyone elses’ just a different color) for only $160, can’t be beat. I love it. I bought a metal trash can and a seperator system from rockler to round out the system, and it works great. Especially with my new planer.